Charleston, South Carolina riverfront Homes For Sale & waterfront real estate and home listings on MLS below. Outside of having a house on the ocean maybe the next best thing is living on the river, and to some that’s better. Living on the riverfront allows for easy fishing, crabbing, easy access to a boat, and your own waterfront view without tourists. Usually. Which type of waterfront house do you want? Charleston SC offers you some unbelievable inshore fishing for red drum, flounder, speckled trout, and more right from your own backyard. Most of our inlet waterways lead straight out to the open ocean in case offshore fishing is more your thing. Feel free to search the Charleston area’s best riverfront homes for sale on the market and let me know if you want to see some. Oceanfront, beachfront, riverfront property is always the most sought after and below are most commonly desired areas: More areas with waterfront homes are Mt Pleasant, Folly Beach, West Ashley, Seabrook Island, James Island, Johns Island and North Charleston. Most deep water front homes in the Charleston area are going to begin close to if not; $1 Million to as you can see well over $5 Million depending on the location you want. Rest assured there is nothing like owning waterfront property in Charleston SC, and the lifestyle that only low-country living can provide. The Ashley which is where the name of “West Ashley” comes from because that part of Charleston is west of the Ashley river. Waterfront Homes in West Ashley like most of Charleston’s waterfront are hard to come by and do not come cheap, but are more affordable than the other areas usually because they include not only West Ashley, but North Charleston waterfront homes, and Summerville both of which are further from the city and beaches. Search waterfront homes under $500,000. The Cooper : The Cooper River the largest of the four is where “East Cooper” the nickname for Mt Pleasant is derived from just like West Ashley. Homes east of the Cooper are usually more expensive than their counter parts in Charleston simply because they include Mount Pleasant and Daniel Island property the two most expensive suburban towns of Charleston county. Aside from downtown Charleston homes, riverfront homes in Mt Pleasant and riverfront homes in Daniel Island will be the most pricey. The Cooper River can take you all the way to two of famous large lakes in SC (Lake Marion & Lake Moultrie) where lakefront homes can be very appealing because these two freshwater lakes are substantial in size. However, they are about an hour drive time from Charleston by car. The Wando also includes riverfront properties in both Daniel Island and Mount Pleasant and is one of the favorite rivers of the area due to its sheer size and convenience to everything. 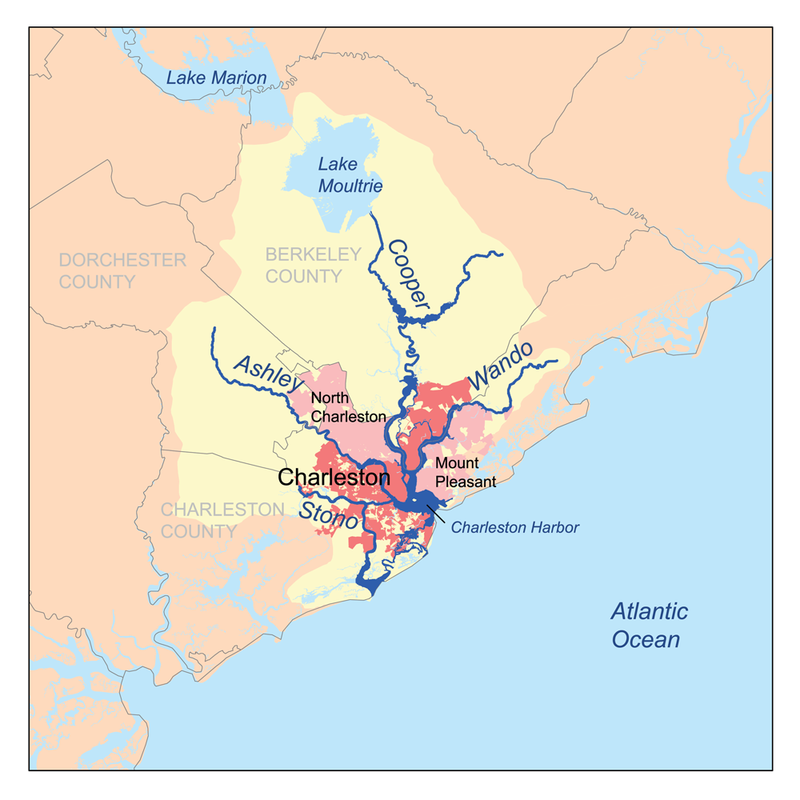 The Stono The Stono river is the one that is most closely related with John’s Island, Kiawah Island waterfront homes, and Seabrook as it is the river that provides most of the waterfront homes in that area their access to the ocean. As a whole it is a little less busy with traffic than the other three rivers simply because more people live and work around the other three.